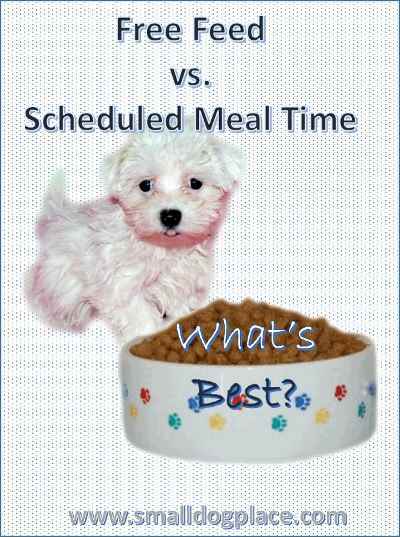 Should you be free feeding or arranging for a scheduled meal time for your small breed dog? There are two schools of thought on this issue: Providing food all of the time or serving meals at regularly scheduled times. For Scheduled meal times, the owner provides food at regularly scheduled times depending on the age of the puppy or adult dog. Free Feeding is the method of leaving out the dog food all day long and allowing the dog to eat whenever they wish. There are pros and cons to each method. Free feeding vs. scheduled meals is a subject of much debate among dog lovers everywhere. Everyone seems to have a different opinion as to which method is “right.” Worst yet, the biggest critics claim that those who do not adhere to their favorite method will be hurting their dog. Dog owners that advocate feeding on a schedule claim that dogs free-fed end up fat, disobedient and have numerous health issues. On the other hand, many contend that scheduled feedings lead to food aggression and eating problems. The argument can get messy and leave the average dog owner in conundrum. Is one truly better than the other? Dog owners who advocate for scheduled meal time assert that their method creates a structured environment where the dog feels safe and secure. The dog, they claim will also see that you are the “Alpha” Dog because you are in control of his food. This understanding on your dog’s part helps him listen and behave better. Training is thus, easier and less time consuming because the dog knows you are the leader. This method is also useful if you plan to cook for your dog but can be used if you plan to provide a commercially prepared diet as well. Dogs generally do not have as many problems with obesity with this method because the owner can control how much food the dog eats. This, however, can create problems in reverse. Owners who do not know how much to feed might tend to overfeed. This method does require the owner to have a regular routine and be available to provide food at the scheduled times. A few minutes late now and again is not a cause for concern, but the dog does have an inner sense of time and will become anxious if food is not provided at the scheduled times. With this method, water must be available to the dog at all times. Owners who prefer the free feeding method remind their opponents that the dog will only eat when he is hungry and not be pressured to eat when he is not. This method helps dogs determine how much food they want. If they are very active one day, they may eat more and on those days when they get little exercise, they will eat less. The best part of this system is the ease of feeding. You can purchase a large self-feeding container that might last for several days. This method works well for busy households who might otherwise miss a feeding. They always know that pooch never goes hungry. The problem with this method is that house-training is harder and some dogs do not know when to stop eating. So which method is correct? The correct method is that which works best for you and your dog. Most dogs that are free fed DO NOT become obese. Most dogs that are fed on a schedule do not become aggressive with their food or bowl. Many owners stress over doing the right thing, when they know intuitively that they prefer one method over the other. Pick the method that works best for you and your family and you dog will do just fine. Just remember if you do plan to offer food at regularly scheduled times to a puppy, most small breed dogs do best with multiple meal times. Three meals a day for a young puppy and two meals a day for adolescents and adults.